Grade three materials consist of nine themed units, which contain 108 lessons that explore key concepts of our Christian belief and life of discipleship. Each lesson is designed to be taught in 35–45 minutes. Online Extras! 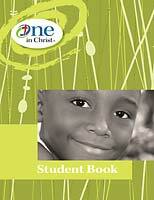 Check out the One in Christ Portal for interactive teaching materials and lesson extenders! 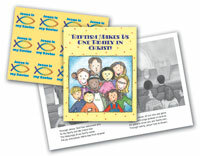 One in Christ Grade 3 teaching materials are arranged in nine units, each with its own theme, worship suggestions, bulletin board, and mission story. Each lesson contains a lesson plan with background information, a classroom devotion, the main theme, lesson objectives, Law & Gospel points, and a materials listing. The Basic Teacher Kit contains the core print essentials to develop religion lessons for your classroom. Teacher Guide. Includes lesson plans that follow the same easy-to-teach, three-part format: Into the Lesson, Into the Word, Into Our Lives. This resource is also supported by the One in Christ Portal. Teacher Resource Book. Includes reproducible sheets, unit Bible verse memory selections, parent letters, assessment ideas, and worship resources. Also available in electronic form on the One in Christ Portal. Student Guide. A colorful study guide with two pages for each lesson. Memory verses, daily activities, and life-application stories give students opportunities to reflect and respond to the lessons. Appendix includes reference materials and study aids. Faith in Action Readers Theater Set A. Engage children in nine skits to help them learn more about the Bible story. Already have the Basic Kit but want to upgrade? Complete Teacher Kits provide the basic materials plus extra printed tools to enhance the student learning experience. Unit Bulletin Board Sets Each of the nine units includes its own bulletin board to help teachers visually reinforce unit themes and lessons. A colorful study guide with two pages for each lesson. Memory verses, daily activities, and life-application stories give students opportunities to reflect and respond to the lessons. Appendix includes reference materials and study aids. Help students learn how to use the Bible in the classroom and in their personal study with this full-color ESV translation of God’s Word. Celebrate Baptism birthdays in your classroom! Each pack contains 24 festive cards, coordinating stickers, and envelopes. Lesson 5: Why Is the Bible Important? Lesson 20: Who Was Martin Luther? Lesson 27: How Did All Things Come to Be?